The M4300 is the worlds first versatile stackable solution designed for full power PoE+ edge, redundant Top of Rack server / storage interconnect, and dependable SMB core deployment. 1G and 10G virtual chassis platform with 10G stacking and PoE+ full provisioning. The M4300 series scales from 24x1G to 48x10G, and up to 384 ports per stack. Nonstop forwarding, spine and leaf, edge to core connectivity for unified wired and wireless networks. Unstoppable operation with management unit hitless failover and no service interruption for the clients connected to the other switches in the stack. The M4300 is the worlds first versatile stackable solution designed for full power PoE+ edge, redundant Top of Rack server / storage interconnect, and dependable SMB core deployment.1G and 10G virtual chassis platform with 10G stacking and PoE+ full provisioning. The M4300 series scales from 24x1G to 48x10G, and up to 384 ports per stack. Nonstop forwarding, spine and leaf, edge to core connectivity for unified wired and wireless networks. Unstoppable operation with management unit hitless failover and no service interruption for the clients connected to the other switches in the stack. NETGEARs family of reliable, high-performance ProSAFE Gigabit Layer 3 Stackable Switches provides maximum throughput and flexibility for demanding networks, with all the Layer 3 features you expect and the future proofing you want. The ProSAFE GSM7328S, GSM7328FS or GSM7352S are ideal as a backbone switches, Gigabit servers, or as the robust core of a demanding, all-Gigabit network. These ProSAFE Gigabit switches can be used to inexpensively off-load routers that are segmenting your network and lay the groundwork for new IP-based services. 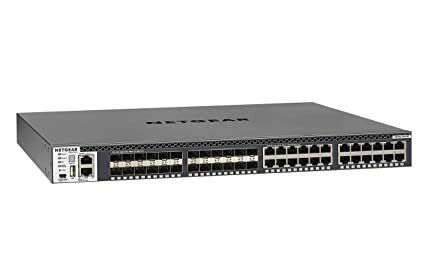 All three switches include four hot-swappable, high-speed module bays which offer options for standards-based10G connectivity or for 48Gbps stacking within the switch family. For maximum flexibility, the GSM7328S and GSM7352S offer 24 and 48 Copper Gigabit Ports, respectively, while the GSM7328FS offers 24 SFP slots for high-density fiber deployments. The non-blocking design of the switch delivers simultaneous, full wire-speed, low-latency throughput to all ports. NETGEARs low-cost, stackable, Gigabit Ethernet switches deliver maximum throughput and flexibility where you need it to high-speed, high-density workgroups at the edge of the network, in the backbone of growing networks or for bandwidth-thirsty file and application servers. 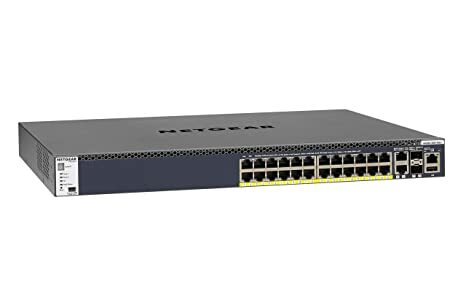 The ProSAFE GSM7328S and GSM7352S fully-managed switches deliver 24 and 48 ports of auto-sensing 10/100/1000 Mbps interfaces for high-density copper connectivity. Four hot-swappable small form-factor pluggable (SFP) Gigabit interfaces provide optional fiber connectivity for longer reach Gigabit Ethernet requirements. 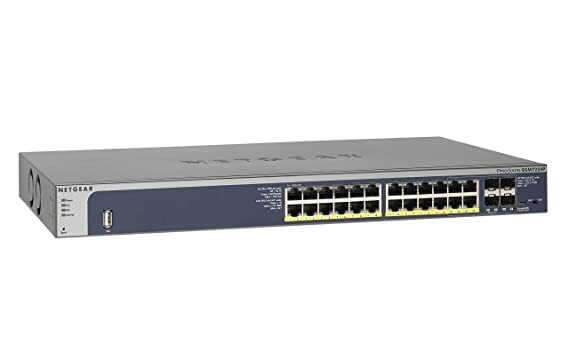 All switches have two 10 Gigabit Ethernet small form-factor pluggable (SFP+) interfaces and two high-speed, module bays offering modular expansion for 10 Gigabit Ethernet or 48 Gigabit Stacking connectivity. 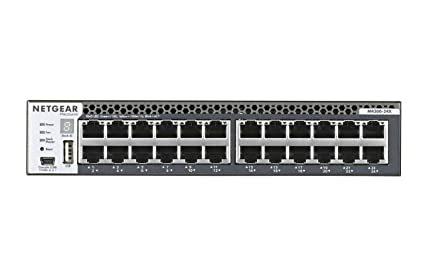 The non-blocking design of the switches delivers simultaneous, full wire-speed, low-latency throughput to all ports. The M4100 series, including GSM7224P, delivers an unbeatable combination of performance, security and ease-of-use for converged networking. Due to the rapid proliferation of multimedia applications, small and mid-sized organizations today have security, control and reliability requirements similar to those of large enterprises. Only NETGEAR is offering reliable, affordable and simple Managed switches packed with higher availability (RPS protection), investment protection (EPS upgrade) and scalability features that have so far been reserved only for enterprise-class VoIP, IP Surveillance and Wireless deployments. NETGEAR Managed switches dramatically reduce the lifecycle costs with Lifetime Hardware Warranty, Lifetime Technical Support, and Lifetime Next Business Day Replacement. 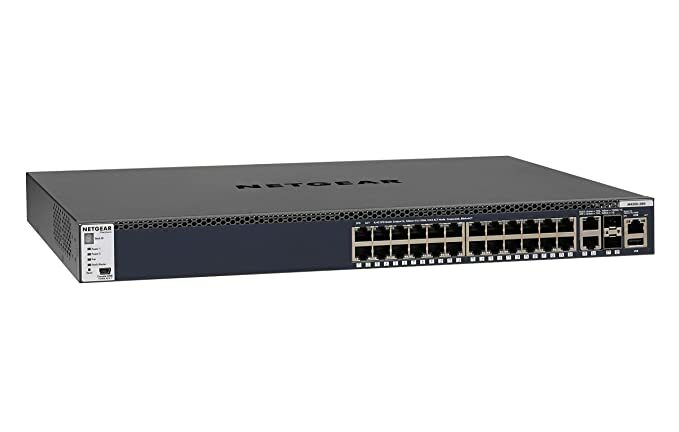 The NETGEAR ProSAFE JFS524 24-port Fast Ethernet rackmount switch helps businesses cost-effectively expand their network. Simply plug in the ethernet and power cables and you are ready to go. The JFS524 is energy efficient, built to last, and rigorously tested to provide the reliability businesses need. The JFS524 is backed by the industry leading NETGEAR ProSAFE LIFETIME Hardware Warranty, LIFETIME Next Business Day Hardware Replacement, and LIFETIME Advanced Technical Support via Chat for peace of mind. The M4100 series, including GSM7224, delivers an unbeatable combination of performance, security and ease-of-use for converged networking. Due to the rapid proliferation of multimedia applications, small and mid-sized organizations today have security, control and reliability requirements similar to those of large enterprises. 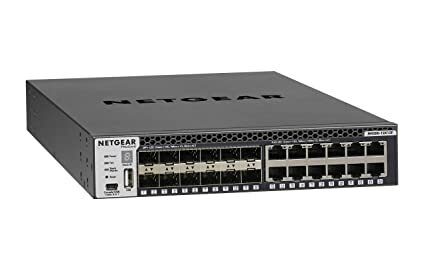 Only NETGEAR is offering reliable, affordable and simple Managed switches packed with higher availability (RPS protection), investment protection (EPS upgrade) and scalability features that have so far been reserved only for enterprise-class VoIP, IP Surveillance and Wireless deployments. NETGEAR Managed switches dramatically reduce the lifecycle costs with Lifetime Hardware Warranty, Lifetime Technical Support, and Lifetime Next Business Day Replacement. 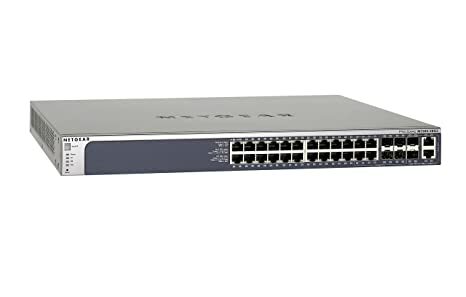 NETGEAR ProSAFE M4300-24X Stackable L3 Managed Switch comes with 24-port 10GBASE-T, 4-port shared 10GBASE-X SFP+ and 480Gbps fabric in a half-width form factor. SDN-ready with OpenFlow 1.3, M4300 Switch Series delivers IPv4/IPv6 rich services for mid-enterprise edge and SMB core with mixed stacking between 10 Gigabit and 1 Gigabit models. Layer 3 feature set includes static and policy-based routing, RIP, VRRP, OSPF, and PIM dynamic routing. M4300 is ideal for server aggregation with Auto-iSCSI prioritization.